The two apple trees on our allotment gave us a whopping 55 kilos of apples this year; 34 kilos of cookers and 22 kilos of eating apples. And that’s just what we picked – we left some cookers on the tree for our plot neighbour to enjoy. Some of them we processed at the time, making several variations of apple jelly. Some we made into apple pie. Some we peeled, prepped and froze in large bagfuls. But the majority were carefully washed, individually wrapped and then boxed according to grade – perfect, slightly blemished and those to use first… a labour of love by Pete. Since then, they’ve been sat in their polystyrene boxes in the garden shed waiting to be used. I’m conscious that we really need to use and process the rest, so a large batch of chutney seemed to be a good option. As I had some fabulous dates leftover from Christmas, I decided to use these too. A web search revealed so many different recipes with such vastly differing ratios of apple, dried fruits, vinegar and sugar that I gave up on following any of them and created my own recipe according to the amounts of apples and dates I had to hand, and sugar and vinegar to my own taste. Ginger powder and chilli powder added a kick and additional depth of flavour. 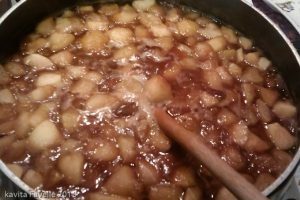 I allowed my apples to cook down until they were really soft but if you prefer them more solid, you may need to reduce the amount of vinegar and sugar you add. 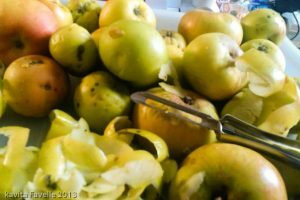 My apples weighed 3.1 kilos before peeling, coring and dicing but many of them were unusually small, and some had a little spoilage, so the weight loss during preparation was higher than usual. 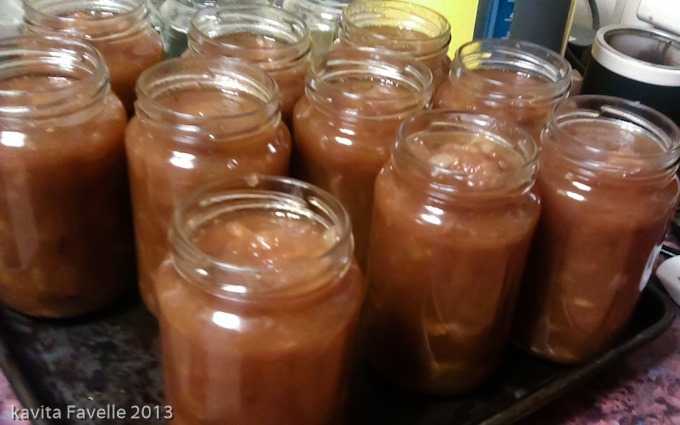 I’d estimate that I used the equivalent of about 2.5 kilos of regularly sized cooking apples in good condition. Stone and roughly chop dates. Peel, core and chop apples into a large pan of cold water. Drain well just before cooking. Measure all ingredients into a large saucepan or stock pot and mix well. Cook on a medium heat until apples soften and liquid thickens. 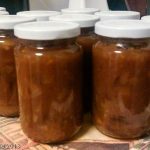 Transfer the hot finished chutney into hot sterilised jars (I sterilise mine in the oven and boil the lids on the stove top) and seal. Leave to mature for at least 3 months. 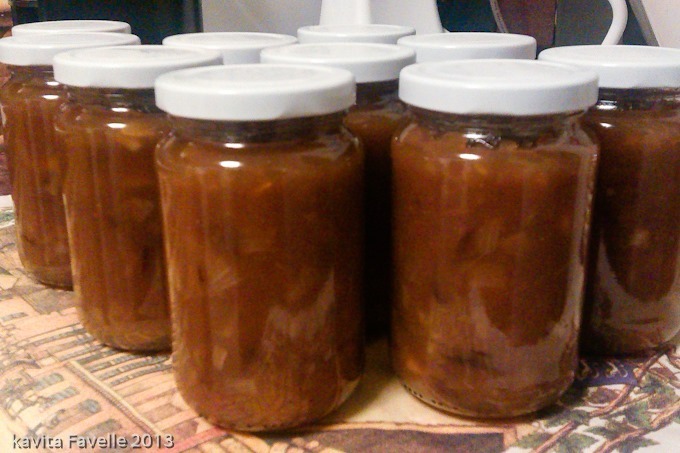 8 Comments to "Kavey’s Apple, Date & Ginger Chutney"
Looks good enough to eat ;-)! I will wait for my ‘taster’ jar. I can save you a jar mum. It’s a 1 lb jar though. But happy to save one for my mummy! Mmm, looks delish and easy. Will definitely try it. Me too usually, but as there are lots and lots and lots of apples needing processing ASAP, I’m being given special dispensation from the cupboard police!